Alice Greenfingers Game Review - Download and Play Free Version! Play with your creativity and run a blooming business! Making money from your harvest! Alice's big dream is to run her own businesss, growing ecological crops and raising healthy animals like in the old days. Her dream is finally coming true as she found the perfect place to rent in the countryside. With the help of a friendly shopkeeper and grandmother's good advice, Alice now begins the hard work of making a living out of her crops. Alice Greenfingers is an intriguing simulation game, where you build and decorate your own garden of flowers, animals and vegetables. Follow the market trends, learn to know your customers and sell ripe crops down at the town market to expand and get your business profitable. Alice Greenfingers is a task management game that places you in control of Alice as she works to turn a piece of land she inherited in the countryside into a large and profitable farm. 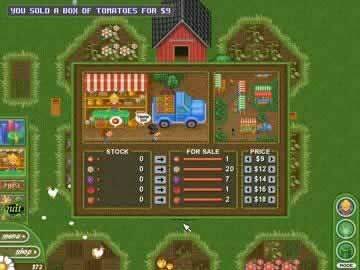 You'll be able to grow a variety of different crops ranging from tomatoes to grapes as you progress through the game. You'll need to seed, water, harvest, and sell these plants at the market to rake in the big bucks. You'll need to take into account market demand and price your crops carefully to make the most money. This game is fairly simple and easy, incredibly addicting, and lets you play at your own pace. Grown Plants and Sell Em! Like many other similar games, the gameplay in Alice Greenfingers is fairly simple and straightforward. You are given a large patch of land on which to build your farm. You're in charge of digging up soil, planting seeds, watering plants, harvesting them, and selling them on the market. As you progress through the game, you'll unlock new plants and items to improve your farm and increase your profits. Even so often, the day will end and you'll be given statistics on your performance (such as your expenses, revenue, and profit). The one big downside is the lack of direction or goals. You're not working towards anything specific, aside from more money. Some concrete goals and objectives could have added some more incentive and a reason to replay. One possible drawback of the game is the level of difficulty. You are able to play at your own pace in this game, and none of the goals you need to meet are very challenging. This makes the game a great choice for newer players or anyone looking for a more relaxing task management experience, but also means that more experienced and skilled players won't find much of a challenge to keep them engaged. The basic controls and gameplay of Alice Greenfingers are simple and introduced to you as you first begin the game. The start of the game takes you through simply interacting with items, digging up soil to plant, seeding the soil, watering plants, harvesting, and anything else you need to know. This game is simple enough for anyone to learn very quickly and begin building up and improving their farm. You need only the mouse and a hefty amount of clicking to perform actions in the game. The one issue with the controls is the sheer amount of clicking you need to do. Since everything is done with clicking, and you've got a lot of different actions you'll need to take, you'll be clicking nearly nonstop. While not unusual for this game genre, this can be a bit annoying and make the game feel somewhat repetitive. 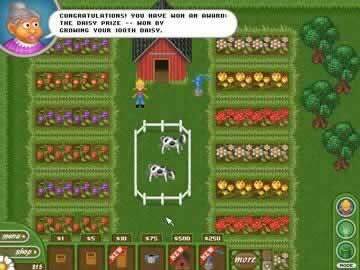 At the same time, the game is very addicting and you want to keep playing to continue to grow crops and improve your farm. Another positive part of the game is the presentation. While they are far from cutting-edge, the graphics are bright and colorful. The music adds some ambiance without being distracting or annoying. Small sound cues give you a heads-up when something important happens (like plants ready for harvesting). The presentation is fairly basic and simple, but works well with the gameplay rather than detracting from the game. Overall, Alice Greenfingers is a good game for almost anyone, especially those looking for an entertaining task management game to keep them playing for hours on end. The lack of a challenge or repetitive nature may put off a few players, but there's a great game to play for anyone else. The ability to organize and decorate your farm as you see fit is an excellent feature that puts you in control. There are a variety of crops you can grow and sell. With no time limits, you can play at your own pace and how you want. 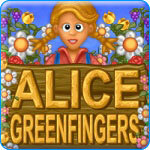 If you like this game or are just interested, you can also check out Alice Greenfingers 2. Alice Greenfingers 2 has everything that this game does, and a whole lot more added in that makes the game even better.